Jobs and career community website Glassdoor has named Microsoft boss Steve Ballmer its "most improved tech CEO" for 2012, though judging by the numbers it's a dubious honor, to say the least. According to the site's latest annual Tech Company Comparison Report, which it published on Tuesday, Microsoft's chief exec scored a CEO Approval Rating of 46 per cent in 2012, well below that of nearly every other executive on the list. In fact, only Netflix CEO Reed Hastings and Xerox CEO Ursula Burns scored lower. So why the hurrahs? It seems Ballmer actually earned an even worse score last year, with a 2011 approval rating of just 29 per cent. That 17-point gain was bigger than that of any other tech exec listed, allowing Redmond's head honcho to walk away with this year's "most improved" award. 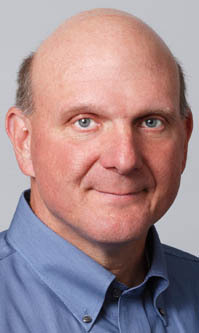 Glassdoor didn't venture to speculate on the reason for Ballmer's increased approval rate. It bases its company ratings on reviews posted by employees, who are asked to rate factors like career opportunities, compensation and benefits, work/life balance, and senior management. They're also asked whether they approve of the CEO: thumbs up or down. It seems likely that Ballmer's increased percentage of up-votes this year can be attributed, at least in part, to Microsoft's renewed multi-device strategy and its aggressive series of product launches, including Windows 8, Windows Phone 8, and Surface. Mind you, the CEOs of some of the other companies listed never even had a shot at the "most improved" category. Google CEO Larry Page's approval rating actually declined, going from 95 per cent in 2011 to a paltry 94 per cent in 2012. Research in Motion's CEO Approval Rate clocked in at 71 per cent this year, up from a demoralizing 18 per cent in 2011. But RIM cheated; co-CEOs Jim Balsillie and Mike Lazaridis resigned in January under intense pressure from shareholders and the board, making way for Thorsten Heins, whose performance in the top spot has been viewed more favorably. Meanwhile, although Mark Zuckerberg's CEO approval rating didn't climb as much as Ballmer's, the Facebook founder has something else to act smug about, having won an approval rating of 99 per cent (up from 90 per cent in 2011).